Darius de Haas is a Chicago born singer with "deeps roots in jazz and soul" (The New York Times) and an award-winning actor. He was part of the original Broadway productions of Kiss of the Spiderwoman, Carousel (revival), Rent, The Gershwins’ Fascinating Rhythm, Marie Christine and the 20th anniversary concerts of Dreamgirls and Hair. 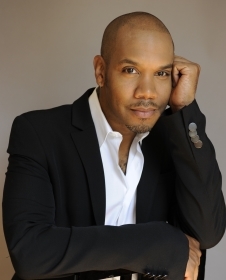 Notable Off-Broadway, regional, touring and premiere credits include his OBIE Award-winning leading performance in Running Man, Once On This Island (1st National Tour), the John Adams opera I Was Looking At The Ceiling and Then I Saw the Sky and Jesus in Jesus Christ Superstar – Gospel at the Alliance Theater. He is known to many musical theater fans for his role of Cain in the Stephen Schwartz musical Children of Eden in which he sang "Lost In The Wilderness". His stature as a solo artist was launched when he made his Carnegie Hall debut with the Cincinnati Pops. Soon after he performed his own two highly acclaimed concert tributes — featuring the music of Billy Strayhorn and Stevie Wonder — for Lincoln Center's American Songbook Series. His singular abilities and range in popular music, jazz and musical theatre have established him as a performer in a variety of settings as well as a guest with several orchestras and groups including the National Symphony, The Philly Pops, Baltimore Symphony, The Los Angeles Master Chorale, London’s Royal Festival Hall, The Kennedy Center and The Alvin Ailey Dance Theater's 50th Gala Celebration. Recent concerts include Duke Ellington's Sacred Concert of Music at Disney Concert Hall and "Too Hot To Handel" at Carnegie Hall. He has performed, recorded and/or toured with such diverse artists as Elvis Costello, Debbie Harry, Marvin Hamlisch, Roberta Flack and Vanessa Williams. TV appearances include My Favorite Broadway: The Love Songs, In The Life, The View, Good Morning America, The Today Show and A&E's Private Sessions. His voice can be heard on the soundtracks of the films Anastasia, Martin and Orloff and Chicago. Darius is featured on numerous original cast recordings. His solo works include Darius de Haas: Day Dream – Variations on Strayhorn and Quiet Please, with pianist Steven Blier.